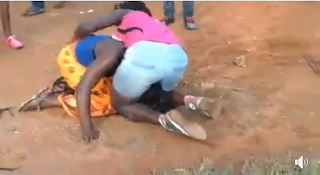 A lady gave bystanders an eyeful during a fight in public with another lady. The ladies engaged each other in an embarrassing show after deciding to wash their dirty linen in public (literally). The cause of their quarrel was not revealed but lady on pink top appeared to have started the fight after slapping her colleague following an argument, according to a footage posted online. 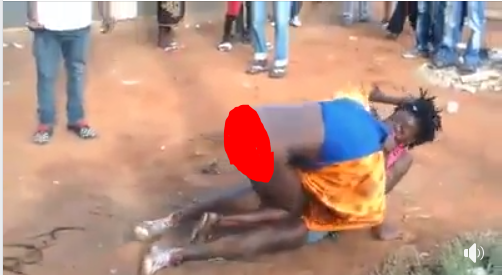 The lady in blue tried not to fight till the other lady (in pink) removed her wrapper and showed off her nakedness. This angered her as she reacted with series of punch. She knocked out her rival who laid motionless on the ground after climbing on her during the fight. While the fight was going on, the men around were making funny noises due to the “free entertainment” as they filmed the clash.